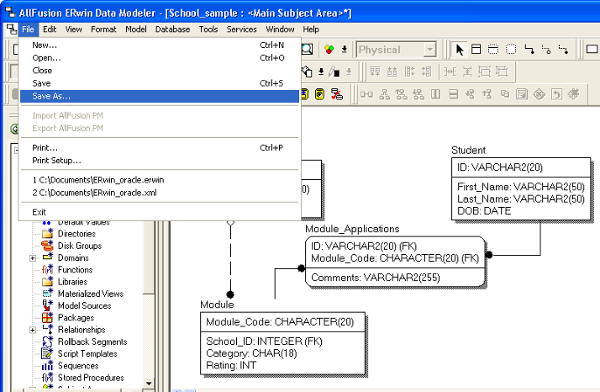 ERwin Data Modeler is a data modeling tool. You can import ERwin diagrams and entity models into Visual Paradigm with all properties preserved. Here is a ERwin Data Modeler Project. In order to allow Visual Paradigm to import it, you need to save it as an XML file. Select File > Save As… from the menu. 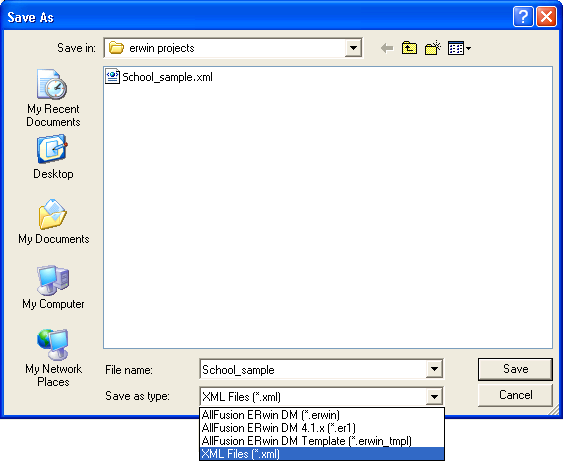 Select XML Files (*.xml) in Save as type and enter the file name in the Save As window. Click Save. This popup the Save as XML File window. 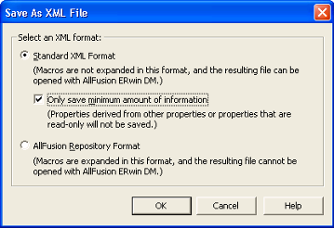 Keep using the default settings Standard XML Format and Only save minimum amount of information. Click OK to confirm. This saves an XML file that can be used for importing into Visual Paradigm. To import an ERwin Data Modeler project into Visual Paradigm, select Project > Import > ERwin Project(XML)… in the toolbar of Visual Paradigm. Specify the file path of the XML file. Click OK to start importing. When import is completed, the Open Imported Entity Relationship Diagram(s) window will appear. Select the diagram(s) to open and click Open to open them. The drawings will then be opened.